Well Panther Nation Billy is a little tired after working two EIU basketball games today. Both teams had hard fought battles with the men just coming up short. What an atmosphere at The Sommet (scratch that) Bridgestone Arena this evening. Panthers all short against No. 1 seed Murray State, 55-51. Maybe an outside chance that the CBI post-season basketball tournament, but only time will tell on that one. 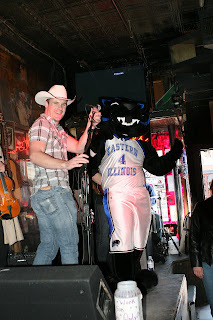 One good side note, Billy did make his appearance at the World Famous Tootsie's singing a song with former EIU linebacker and budding country music star Jake Maurer. Can't wait to see what Saturday holds. Panther women take on Austin Peay at 3 p.m. for the OVC championship. Maybe Saturday's Billy photo op will be cutting down the net.